Everyday it will be a quiz in the WOC 2018 Live TV. 16:00 C.E.T. all questions will be updated here. Latest 18:00 C.E.T. you must have sent your answer. Send your answer to wocquizz@worldothello.org or send an text SMS to +46 720 16 52 22. Write your full name, emailaddress, your answer (for example, 1-X-2-X-1). 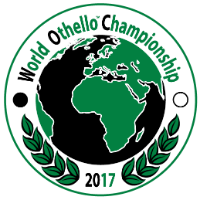 You can see the right answers and the winners in the Studio Othello every evening. And here, of course! When was the first WOC held in Prague? Who is the youngest person that played in the WOC? Which country previously played in the WOC? What city has hosted the WOC the most time? What is the sum in age of all youth players playing in the 2018 WOC? How many tables are there in the Media Room? Who was the youngest player ever to win an EGP title? WOC has been in Japan 5 times, 3 times in Tokyo. What other town has it been in?